Product prices and availability are accurate as of 2019-04-25 02:35:27 EDT and are subject to change. Any price and availability information displayed on http://www.amazon.com/ at the time of purchase will apply to the purchase of this product. Rowing has long been recognized as the perfect aerobic pursuit, with naturally smooth and flowing movements that don't tax the joints but do boost the heart rate. Now you can take your rowing experience to the next level with the WaterRower Oxbridge rowing machine. Using the same principles that govern the dynamics of a boat in water, the WaterRower Oxbridge is outfitted with a "water flywheel" that consists of two paddles in an enclosed tank of water that provide smooth, quiet resistance, just like the paddles in an actual body of water. As a result, the machine has no moving parts that can wear out over time (even the recoil belt and pulleys don't require lubricating or maintaining). More significantly, the water tank and flywheel create a self-regulating resistance system that eliminates the need for a motor. As with real rowing, when you paddle faster, the increased drag provides more resistance. When you paddle slower, the resistance is less intense. The only limit to how fast you can row is your strength and your ability to overcome drag. 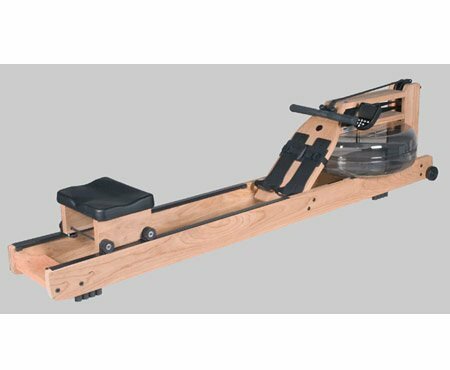 And unlike conventional rowing machines, which tend to be jerky and jarring, the WaterRower Oxbridge is remarkably smooth and fluid. From a fitness perspective, the WaterRower Oxbridge works 84 percent of your muscle mass, helping tone and strengthen your muscles while burning far more calories than most other aerobic machines. The exercise is also low impact, as it removes all the body weight from the ankles, knees, and hips, but still moves the limbs and joints through a full range of motion--from completely extended to completely contracted. 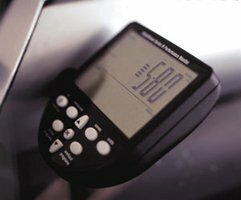 The WaterRower Oxbridge is outfitted with a Series 4 performance monitor that's designed to balance technical sophistication with user-friendliness. The monitor--which includes six information and programming windows, six QuickSelection buttons, and three navigation buttons--displays your workout intensity, stroke rate, heart rate, zone bar, duration, and distance. Plus, the monitor is compatible with an optional heart rate chest strap and receiver, which helps you optimize your workout and achieve your exercise objectives. The WaterRower Oxbridge is handcrafted in solid cherry wood, which may vary in color from red/brown to deep red and will darken with exposure to light. 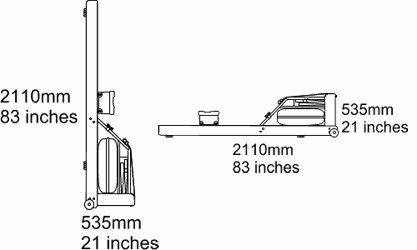 For this reason, all WaterRower cherry wood components are kept in light-free rooms to protect from shadowing before being sold to the public. Initially, a new WaterRower Oxbridge will appear quite light in color, but will darken over time until it reaches a rich reddish hue. The cherry wood was chosen due to its marvelous engineering properties, especially its ability to absorb sound and vibration, which enhances the WaterRower's quiet performance and smooth operation. In addition, the wood is harvested from replenishable forests and is hand finished with three coats of Danish oil to give it a deep luster and warmth. Other details include dual rails with four corner wheels that increase seat stability and reduce the amount of sweat buildup; a frame that flips upright for handy storage; and a weight capacity of up to 1,000 pounds. The WaterRower Oxbridge measures 84 by 21 by 22 inches (W x H x D), weighs 117 pounds (with water), and carries a one-year warranty on the frame and components (WaterRower will upgrade the warranty to five years on the frame and three years on the components with the completion of a registration form).